Hotel Dubrovnik Palace is situated on a beautiful peninsula called Lapad, below the park of little Petka woods, with a unique view to the Elaphite islands. Surrounded by the sea and pine woods this 5-star hotel is ideally located to meet guests that seek privacy and relaxation. Hotel Dubrovnik Palace provides a total of 308 bedrooms and suites together with a VIP wing. The hotel's unique cascading architecture allows that all of them have a private balcony and spectacular sea view. The carefully selected materials such as quality wood, fitted carpets and natural stone are the basis of a stylish and rich interior. Room amenities include en-suite bathroom with power shower, flat-screen satellite TV, bathrobes and slippers, exclusive toiletries, mini bar, direct-dial telephone, air-conditioning, safety deposit box, turn-down service, pay-per-view TV channels and free Wi-Fi Internet. Great food, spectacular views and fine service are the bywords of dining at the Dubrovnik Palace. Maslina Tavern provides a relaxed and informal dining experience by the sea. Maslina is a traditional Dubrovnik-style tavern, where the atmosphere is relaxed and the menu is filled with hearty Mediterranean and Dalmatian dishes. Elafiti Restaurant is the main restaurant of the hotel serving a rich buffet selection for breakfast and dinner. Beach Restaurant Ponta is the ideal place for a delicious summer snack, while overlooking the magical Mediterranean landscape. Lean & Light is the restaurant on the 10th floor, serving smoothies, raw foods, fish, light salads and low-fat desserts. This restaurant has magnificent views of the Elaphite islands and the lighthouse directly in front of the hotel. Fine Dining Restaurant Luna for private parties and selected events serves local and international cuisine in a refined and welcoming atmosphere overlooking the sea. Sunset Lounge is the main bar and lounge of the hotel with a panoramic view is the ideal place to enjoy a cocktail and watch the sunset while listening to live music. Lanterna Glorijet Bar is a pool side bar including a swim up side for daytime enjoyment. A friendly and enjoyable place to enjoy a daytime beverage or interlude from sunbathing on the beach. Vala Beach Bar is a poolside bar, located in the separate VIP area. It offers you complete tranquility during the summer season, and a wide selection of refreshments and light lunches. Hotel Palace has its very own private beach. Guests can enjoy in jet-ski safaris, water skiing, tubing and other water sports. The hotel is also home to a licensed PADI scuba diving centre. This professional diving centre offers a range of dive courses; from beginners diving lessons to professional dives and night dives on breathtaking underwater reefs. Hotel Dubrovnik Palace offers a choice of indoor and outdoor swimming pools. During the summer, guests can enjoy hotel's three outdoor pools. The main pool allows you to relax in a warm Jacuzzi bath or swim up to the Lanterna Glorijet Bar for a coffee or your favorite drink without even leaving the pool. There is also a children's pool. The third pool is next to the VIP Vala Beach Bar. In winter, you can relax in the hotel's indoor pool, which offers a complete relaxation area and two Jacuzzis. Energy Clinic spa is located on the 10th floor of the hotel. It offers an extensive range of high quality health and beauty services. Facilities of the spa include 1510 m2 spa and wellness area, freshwater pool, two jacuzzis, Turkish bath and Finish sauna, six treatment rooms, one VIP treatment room for couples (with Jacuzzi), fitness studio with cardio and strength equipment and relax zone. Hotel Dubrovnik Palace offers eight flexible conference and meeting rooms, with capacity from 10 to 750 delegates (1000 participants via video-link) and a self-contained separate conference entrance with registration desk for participants. Hotel's terraces are ideal for informal gatherings, cocktails and coffee breaks, and the bar is perfect for short breaks or just to take a drink with a colleague. The Sunset Lounge is ideal for conducting a casual meeting, or simply for relaxing after a busy day. At the hotel you can book a wide range of Dubrovnik city tours and excursions to surrounding area and countries (Elaphite islands, Konavle, Peljesac, Korcula, Mljet, Mostar, Medjugorje, Montenegro etc). 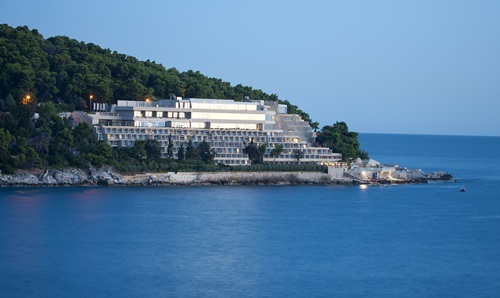 Hotel Dubrovnik Palace is also home to the licensed Blue Planet Padi scuba diving centre. Although hotel is located in isolated location beneath Petka hill it can be easily reached by city bus no. 4 from Old Town. If you arrive to Dubrovnik by plane you can prebook your private car transfer to reach the hotel or take the airport shuttle bus to Pile Gate and from there take bus no. 4 to the hotel (travel until the last bus stop).